Conrad's English House: Who is the real "Last Samurai"? Who is the real "Last Samurai"? I (not Tom Cruise) am the real "Last Samurai". Joke! But on May 3, my father and I marched through the main streets of Odawara along with 2000 other samurai warriors and I did feel a little like a samurai, haha. 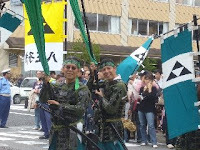 We took part in the Odawara Hojo Godai Matsuri (festival). It is the largest sight-seeing event of the year in Odawara. The annual event reminds us of the glory attained by the five generations of the Hojo family. After all, in the 16th century, Odawara was the cultural and industrial center of eastern Japan under the power of the Hojo clan. It was during this time that the Odawara Castle became the biggest in all of Japan. Castle-town Odawara was protected by the sea on the east side and by rivers and mountains on all other sides. Odawara Castle was originally built about 800 years ago. It has been destroyed and rebuilt several times, most recently in 1960. Now Odawara is the only castle town from which you can see Mt. Fuji. I love living in this city!